*Once a year you’re allowed to go mad, as the old Latin proverb attributed to Seneca says. Celebrity Chef Marco Pernini talks about the culinary delights to be found at a traditional carnival party. With all that’s going on in the world, I’d venture to say more than once a year. In fact, you’re allowed to go mad as often as you want to. Just remember to always do so in moderation – going over the top never looks good. The festive mood of Christmas and New Year is over and spring has yet to begin, so it’s easy to feel a bit down. Therefore it makes perfect sense to get into the fun spirit of the ancient carnival tradition, and indulge yourself in food that can cheer the heart. Recipes for carnival celebration food abound, and the traditional food has evolved over the years, adapting to changing local consumption and produce (something we should be doing more often to keep a fine balance between what Mother Earth produces and what we consume). For instance, in Brazil, one of the most famous carnivals in the world, they make spicy food to go with their even spicier outfits. This is most appropriate for the hottest month in the southern hemisphere. In New Orleans, meanwhile, they prepare for Mardi Gras a special gumbo with chicken or shrimp and added spice that shows the influence of Caribbean taste in that region. And while the festive mood of the carnival is, above all, associated with making various types of cakes for the children, it actually gives adults an excuse to get a bit silly too. I’m going to focus just on the Italian carnival tradition – after all it’s where it all started – and I want to indulge myself and tell you about the numerous cakes that are to be found all over Italy. Italy is a united country now, but it hasn’t been so for long – only last year we celebrated the 150th anniversary of unification. It had been a poor country, divided into many small states, not only fighting against each other in wars and in culture, but also in the art of cooking. Of course, poverty is the mother of all inventions and Italians were the masters – adapting and readapting their creations constantly with the ingredients they had available. The result is an extraordinary selection of recipes that vary from region to region, varying almost as much as the works of art you may find scattered around every church, every palazzo and every piazza corner. Italian cuisine is good because it is simple but, as I always say to my dinner companions, the secret is how you choose your ingredients. Don’t forget that everything you put in your mouth becomes a part of you, so you should always be careful of what you choose to put in it. It has been quite a task researching the many traditional carnival cake recipes, but I have managed to find the most popular delicacies of Italy. Now I’m passing them on to you for your own indulgence and to help you get yourselves into that carnival spirit. This is a speciality found in Abruzzi, Umbria, Le Marche, and Lazio. It is a cake made with flour and eggs, with some variations, adding either olive oil , sugar, lemon juice, or liqueur. Make 1 cm balls out of the mixture and then fry them in olive oil or cooking oil. Drain the excess oil once they’re done, then dip them in a heated solution of honey and stick them all together so that when cooled down they make one whole cake. The use of honey shows how ancient this recipe is. These are the southern version of the circerchiata above. 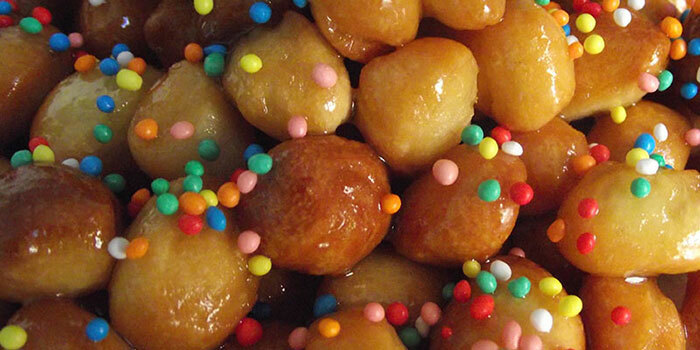 The Neapolitan struffoli look like the circerchiata but the two recipes differ in many ways. 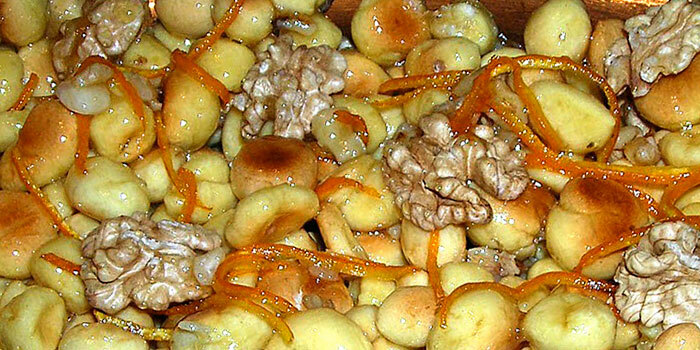 The Neapolitan sweet is decorated with cannullilli e diavulilli, that is, candied fruits and other coloured sweets, which give them their festive feel. One variation of strufolli is to bake them in the oven, so they come out a bit lighter. This cake is typical of the Friuli region. Making these can be great fun for the children as they help their mother with stirring the mixture, which, here, consists of eggs, flour, lard, and added baking powder and is flavoured with aniseed-based liqueur and lemon zest. 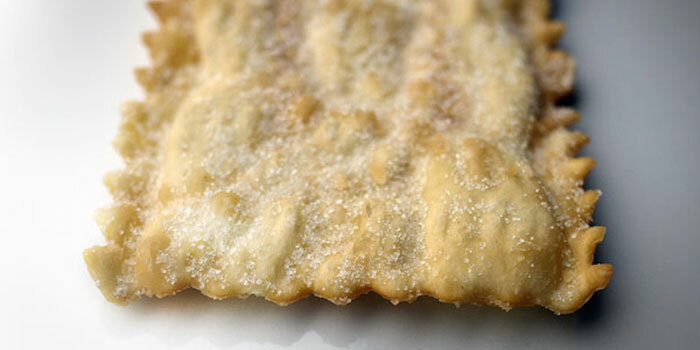 The castangole is then either fried or baked till golden. These are little half-moons of thin pastry, made of flour and water and a bit of sugar, that are filled with jam or dried fruit inside, or sometimes with ricotta and even with pecorino to add a bit of spice. That’s what they do in the areas around Naples. This ismore an Austrian tradition that Italians adopted in the early nineteenth century when Napoleon sold Venice to the Austro-Hungarian Empire. 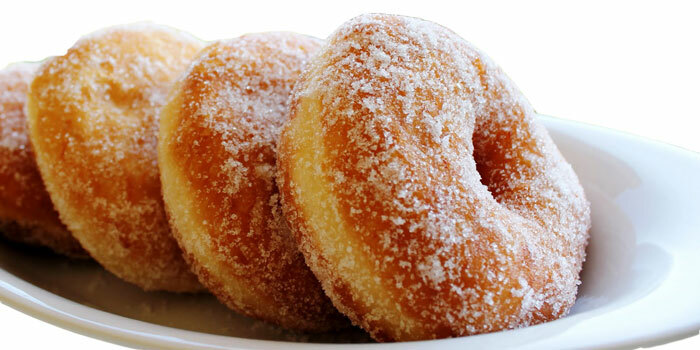 They are basically what we more commonly call doughnuts with either a jam or apple filling. The term zeppole is also used to refer to a cream cake made from choux pastry, invented by the chef Pantarelli in 1540, seven years after he left Florence for France, along with Caterina de Medici and her court. 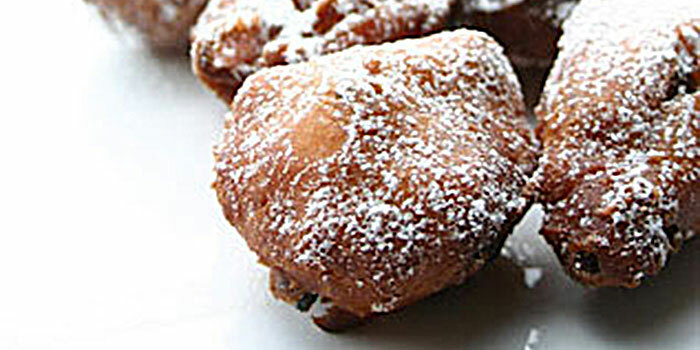 Commonly light-weight, deep fried dough balls of about 5 cm in size, these doughnuts or fritters are usually sprinkled with caster sugar and may be filled with custard or pastry cream as they do in Rome. Zeppole are traditionally eaten on the 19th of March, St Joseph’s Day, where in Naples the zeppole makers set up their deep-friers outside their shops and nearly fight each other for the passing custom. These are the most typical cakes to be found during the Venice carnival. 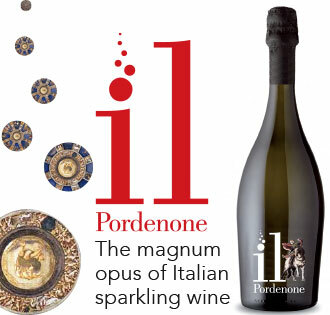 They are first mentioned in a recipe book from the 1500’s written by Bartolomeo Scappi. 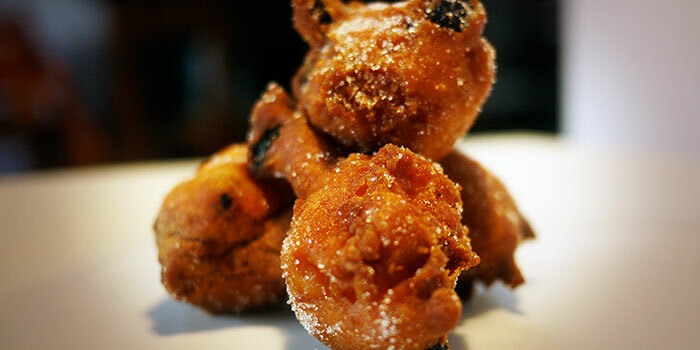 In 1600, the fritters were only prepared by a very select number of pastry chefs and the art of the fritter was handed down from father to son. Only in 1700, at the time of the Venetian republic, did it become a more national cake. The base mixture is made with plain flour, eggs, sugar and milk and then pine nuts and sultanas are added, together with a drop of rum and some lemon zest. Once deep-fried, they are sprinkled with sugar. 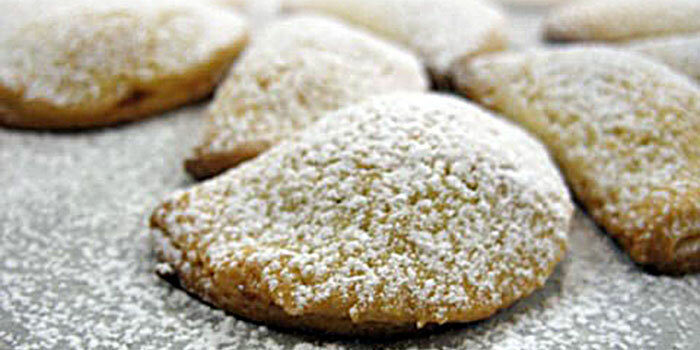 A Venetian variation has them filled with delicious zabaione cream. Now we come to my favourite! Not only are these the simplest of all the carnival cakes to make but they are the most fun. 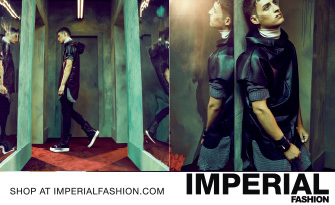 As a result, they are the most widespread and popular. In fact this is the one cake that is found in every part of Italy though sometimes it goes by different names. For instance in Friuli they are called crostoli; in Emilia-Romagna, sfrappole; in the Veneto, galani; in Le Marche and Umbria, frappe; and in Campania, they are called chiacchere. The regional variations mainly consist of which liqueur is added, depending on what was available locally: Marsala in the south, white wine or grappa in the Veneto and Friuli, or Mistra’, an aniseed-based liqueur, as in my region, Umbria. And I leave you with my special recipe for it. Place the flour on a table and make a well. Mix the eggs, salt, sugar, vanilla and Mistrà. Pour the mixture into the well. Using a fork, gently fold the flour into the egg mixture, Switch to your fingers once the flour is all wet and carry on mixing together. Knead well until the ingredients form a smooth paste. Roll the paste out with a rolling pin (although a pasta machine will do) and make it as thin as possible – the thinner, the better. Cut the frappe with a shape cutter 10-15 cm long. I like my frappe to be different shapes, so they mirror the many types of carnival masks. Fry in vegetable oil until crispy. When they have cooled, sprinkle with icing sugar. And now, taste the history of Italian carnival by having a go at making one or two, or all, of these recipes and you`ll have a party to remember! 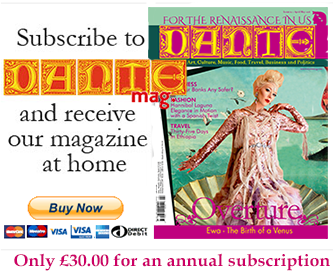 Buon Carnevale to all DANTEMAG readers wherever you are in the world!